As one of the most fixed bastions of Dutch death metal, Sinister kept it's activity since today, and reminds to a scene that have seen better days before. Such as the genre, the band also had it's most remarkable period in the early '90s. 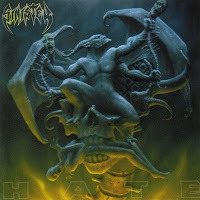 After two brutal and undoubtedly stunning albums they probably showed their maximum by "Hate". They came with same rough brutality and excellent sound like earlier, but their themes turned a bit more complex. On the side of their usual primitive and aggressive tone, perfect song compositions turned their music more diverse without changing their style or wihout to experiment with different influences. The involving of occasional atmospheric background almost gave new dimensions to the sound, but sadly these were not used so often to open a new chapter in the band's life. However these small changes were enough to give a different impression to "Hate" and to increase it's effectiveness. The third masterpiece of Sinister was still unable to cause any disappointment.